While pools are a blessing in the Australian heat, they’re a double-whammy in the cost department: they not only consume a significant amount of energy, but can also require regular water top ups as well. On average they’re responsible for 12% of common area energy usage in apartment buildings. Luckily there are many projects that can be implemented to save up to 80% on the running costs of the pool. The good news? It won't require the most expensive pump on the market. The biggest offender of energy usage is the pool pump, but it’s possible to save big by swapping to a minimum 5-star rated pool pump. 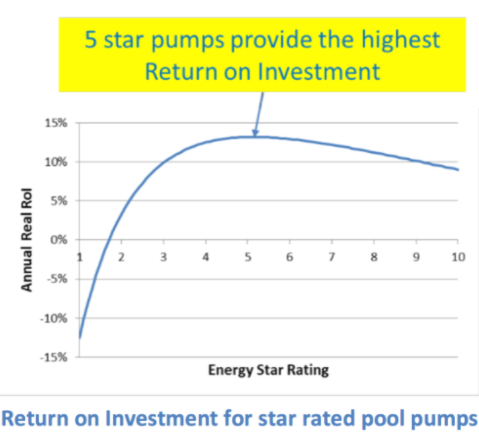 In fact, in a study on pools in residential homes, it was found that upgrading to a 5-star pump provided the highest return on investment due to its cost to savings ratio. These energy efficient pumps will often have a built-in multi or variable speed drive. This means that the pump can be set to a lower speed and consume less energy, at the same time taking pressure off the plumbing and reducing maintenance costs. These pumps are usually quieter as well, which means they can be run overnight, and make use of the cheaper off-peak rates. Strata pools generally have higher usage traffic, so this needs to be taken into account when putting a pump on a timer. But it's been found that in many buildings the pumps are being run for longer than necessary to filter the entire body of water at least once. Make sure the timers are only running as long as actually needed, and run pumps or heating during off-peak times to avoid paying top price. For strata in Queensland, there are even more savings to be had by taking advantage of the super economy Tariff 33, which is a discounted rate that allows for electricity usage up to 18 hours/day outside of peak times (usually around 10pm-7am). As a bonus, Energex are offering a $200 incentive for Queensland properties to connect their pool to Tariff 33. Pool heating is another area of significant energy usage. Where possible, install solar pool heating to heat a pool for free and extend the swimming season by a few more months. If this is not available, the next best options are: a heat pump, gas heating, or connecting an electric heating system to an Economy tariff. After all that energy has gone into filtering or heating water for the pool, the last thing you want is for it to all go to waste through evaporation. For outdoor pools, use a pool cover when the pool is not in use to reduce evaporation loss of water, which will save energy and reduce water costs as the pool won’t need to be topped up as often! A windbreak will have the same effect year-round.